(a) Install a new gasket and the drain plug after draining engine oil. NOTICE: Do not disconnect the hose. (a) Remove the 12 bolts and 2 nuts. (b) Insert the blade of SST between the crankcase and oil pan. Cut through the sealer and remove the oil pan. NOTICE: Be careful not to damage the contact surface of the cylinder block and oil pan. CAUTION: Do not attempt to hang the engine by hooking the chain to any other part. (b) Remove the bolt and disconnect the engine mounting insulator FR. (c) Remove the bolt and disconnect the steering gear return hose clamp from the frame. (d) Remove the 4 nuts from the engine mounting insulator RH. (e) Raise the engine and remove the engine mounting insulator RH. (a) Remove the 3 bolts and engine mounting bracket. 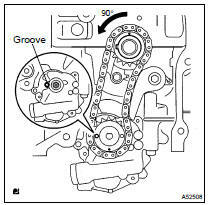 (a) Turn the crankshaft counterclockwise 90 , and align the adjusting hole of the oil pump drive sprocket gear with the groove of the oil pump. (b) Insert a bar (f 4.0 mm (0.16 in.)) into the adjusting hole of the oil pump drive sprocket to temporarily lock the sprocket in position. Remove the nut. (c) Remove the bolt, chain tensioner plate and spring. (d) Remove the chain tensioner, oil pump drive sprocket and chain. (a) Remove the 3 bolts, oil pump and gasket. (a) Install a new gasket and oil pump with the 3 bolts. (a) Set the crankshaft key in the horizontal left position. (b) Turn the cutout of the drive shaft to the top. 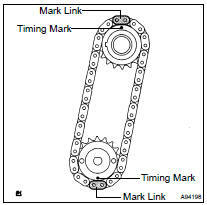 (c) Align the mark links (yellow colored links) of the chain with the timing marks of the gear as shown in the illustration. (d) Insert the gear together with chain into the crankshaft and oil pump shaft. (e) Temporarily tighten the oil pump drive shaft gear with the nut. 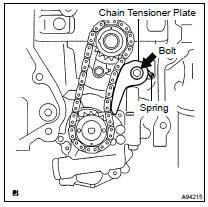 (f) Insert the damper spring into the adjusting hole, and install the chain tensioner plate with the bolt. (g) Align the adjusting hole of the sprocket with the groove of the oil pump. (h) Insert a bar (f 4 mm (0.16 in.)) into the adjusting hole of the sprocket to temporarily lock the gear in position. Install the nut. (i) Rotate the crankshaft 90 clockwise and align the crankshaft key with the top. (a) Install the chain vibration damper with the 2 bolts. (a) Install the engine mounting bracket with the 3 bolts. (a) Raise the engine and install the engine mounting insulator RH. (c) Install the steering gear return hose clamp to the frame with the bolt. (d) Install the engine mounting insulator FR with the bolt. Install the oil pan within 3 minutes after applying seal packing. Do not start the engine for at least 2 hours after installing. (a) Remove any old packing (FIPG) material and be careful not to drop any oil on the contact surfaces of the cylinder block and oil pan. 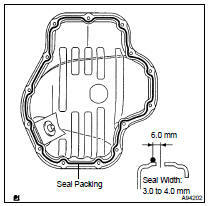 (b) Apply seal packing in a continuous bead (Seal Width: 3.0 to 4.0 mm (0.12 to 0.16 in.)) as shown in the illustration, and install the oil pan. (c) Uniformly tighten the 12 bolts and 2 nuts in the sequence shown in the illustration.